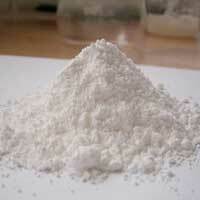 We are instrumental in bringing to clients superior quality Titanium Dioxide Powder. Titanium Dioxide Powder is formulated with the best compositions and is highly pure. This range of Titanium Dioxide Powder undergoes stringent quality control tests after procurement to make it free from all defects. We offer the clients Titanium Dioxide Powder at the market leading rates. Solubility : Insoluble in water. Vapor Density (Air=1) : Not applicable. Vapor Pressure (mm Hg) : Not applicable.